International term life insurance for pilots is an important overseas insurance benefit. Good Neighbor Insurance provides this benefit to airline pilots throughout the world. Our international term life insurance covers airline pilots who are commercial pilots, personal pilots, missionary pilots, and pilots who serve social good organizations outside the United States. To learn more about our international term life insurance benefits with Petersen International please head over to our web page at https://www.gninsurance.com/petersen-international-term-life-insurance-residing-outside-u-s/. Will you be flying for pleasure or for work? Who you will be flying for. Is this a non-profit organization, for-profit organization, or a faith based organization? Are the runways paved or not? Will you be flying in stated country or outside of the country you are residing? How many years will you be residing overseas? Here is an excerpt from one of our clients: Yes I am a pilot, and once we are in the South Pacific I will be flying on a daily basis. We operate 6 air ambulances; they are Cessna 206’s on Aerocet amphibious floats. International term life insurance is not only for those who have high risk jobs overseas. Good Neighbor Insurance can even provide international term life insurance for stay-at-home moms and dads who are expats living outside of the U.S. Any person from the age of one year old (a parent needs to be on the policy) up to age 70 will be able to go through underwriting with the Petersen International term life insurance benefits. When you are looking at applying for the Petersen International term life policy you will need to know what face amount you want. A face amount is the sum of money your beneficiary will receive on the death of the policy holder. Good Neighbor Insurance will also need to know how many years you want your international term life policy. You may purchase from up to one to ten years. There are no international term life policies that go past ten years, at this time. Once you decide on the two above options you will send this request to one of our licensed agents here in Arizona at info@gninsurance.com or through our web site at https://www.gninsurance.com/petersen-international-term-life-insurance-residing-outside-u-s/. Our team members will work with Petersen underwriting to complete your request and provide you with different quote options for your international term life benefits. 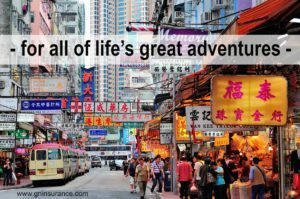 If you will be going overseas for less than 12 months our international Accidental, Death, and Dismemberment (AD&D) option may work best for you located here at https://www.gninsurance.com/accidental-death-dismemberment/. You may also apply for this international AD&D benefit for up to ten years as long as you are residing overseas. Both of these international term life and AD&D options allow you to be covered back in the U.S., even if you are not going back overseas. Connect with one of our licensed international team members for more information or email us at info@gninsurance.com. We are here to serve you, our guests!